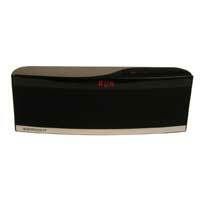 Sleek Design, lighted capacitive controls, superior audio and CALLER ID distinguish this Bluetooth speaker. Pair with smart phones such as iPhones, tablets like iPads, and Mac/PC laptops. Also includes Bass Radiator, long battery life, and dual MEMS Mics to make sure you can BE HEARD. Great for music and conference calls and portable to take your conference on-the-go.